So, it's Sunday. And it feels like it was JUST Friday night. Which, it kind of was. Anyway, today, I woke up early, went back to sleep for a bit and then woke up for good. I did some laundry, made a little breakfast, and got the day started. My first stop was the Nashville Farmers Market. The big issue there is parking. They killed off half the lot, and even back when it was in play, the market could get stupid crowded on the weekends. It was like that this morning. There's sort of Maslow's Hierarchy/Sophie's Choice that comes into play with the Farmers Market. Saturdays are the absolute better of the two weekend days to go, from the standpoint that there are generally more vendors, and more importantly, my favorite vendor is there. Schrock's Family Farm and Bakery. 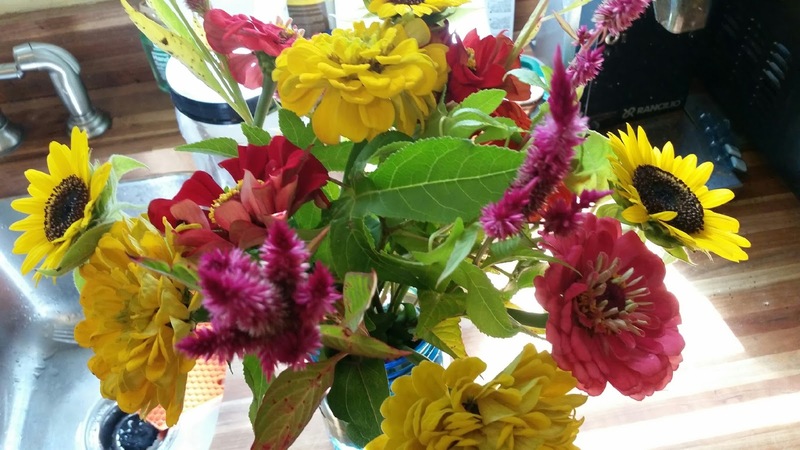 They are a Mennonite family who have the best bread, the most amazing eggs, cookies, cakes, pies, and, most of all - cut flowers that take your breath away. And they're dirt cheap. Well, they're a religious crew, so they only sell on Saturdays. And that's fine. There's always a good crowd and plenty of other things to look at, buy, and taste. The problem with going on Saturday is one small, but significant issue. There's this restaurant at the market called Jamaicaway. Great Jamaican food. The best. When Mom and Dad came for my tonsilectomy, Matt and Dad went one night to pick up dinner there. They loved it. Loved. Matt and I have been eating there for ages. Here's the interesting thing though. The single largest religion in Jamaica is Seventh Day Adventist. Twelve percent of Jamaicans are Seventh Day Adventist (roughly 20% of Jamaicans are "not-religious" and 20% are "other". Anyway, this particular denomination celebrates the Sabbath on Saturday. Ergo, if you want to get Jamaicaway for lunch, you need to go on Sunday. So, I went on Sunday - mostly because yesterday got away from me, but also because I wanted a patty for lunch. Patties are meat pies, and they are amazing, and I would eat them all the time if I could. I had two, actually - though Piper got a little of each - I had a mild beef, and a chicken curry - both were excellent. I also found all the produce I could handle. I got a watermelon (I call them the cannonball variety - they're dark, dark green and round). I got okra, lima beans, I bought some shiitake mushrooms. I bought pretty tomatoes. 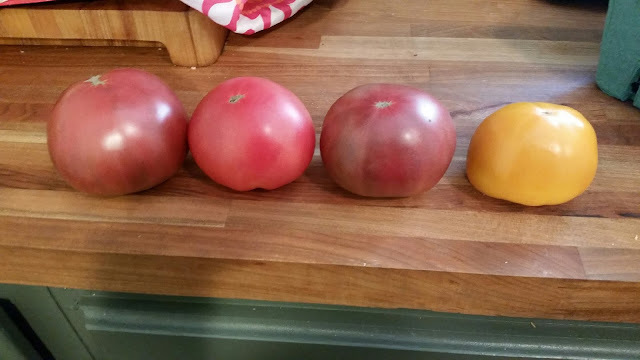 Two Cherokee purple, a Brandywine, and a yellow tomato. 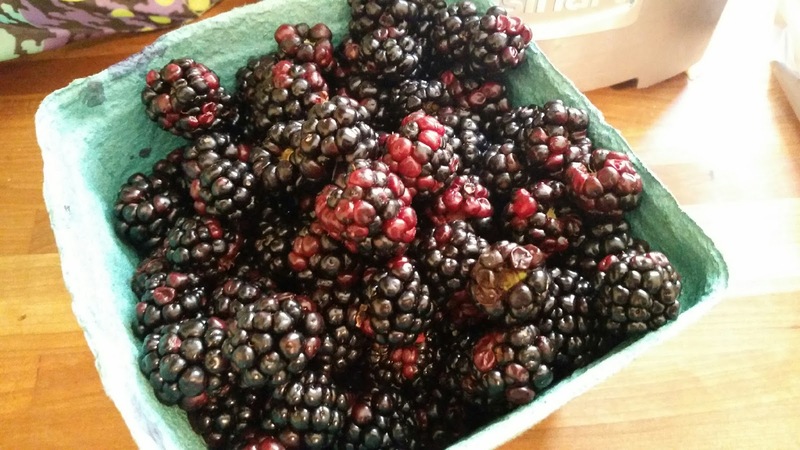 Blackberries, because they are amazing. Zinnias, because I love them. Now, if you'll excuse me, I'm going to have some lemon ice cream with blackberries. There's also a Jamaicaway on Hayes St., just a hop, skip, and a jump from where I work. I've been there a dozen times on my random lunchtime amblings and always thought, I should try the food there. Well now I absolutely have to.